The Aim Sports Tactical Vertical Grip wRails mounts onto any rail system in much the same manner as any other vertical fore grip. Simply slide the grip onto the suitable rail and tighten the screw on the bottom of the grip to secure it. However the Aim grip features rails on both the left and right side of the grip that can be used for mounting accessories like flashlights or lasers. This grip also has a cut for a flashlight pressure switch. 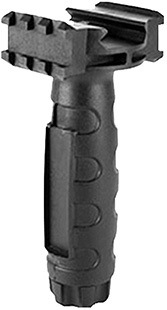 This vertical grip has more features than many of the standard vertical grips on the market.